Things to do in Bali? Best deal in menu of water sport adventure - Bali underwater scooter riding. This trip is suitable for the whole family members. Grandparents, children and adult, those who have never dived with scuba, will be able to enjoy underwater scooter riding . No special skills and equipment are needed to control it. Underwater scooters very easy to use. Only after 5 minutes of briefing You will be able to enjoy the beauty of underwater views. Additional safety will be provided by our experienced instructors. Your tour will start in the morning. Our driver will meet you at the lobby of your hotel and drop you to our office by car. Our company's office located beside the sea. In office you will get instructions, briefing and signing insurance it takes few minutes, then you change clothes and our staff will drop you by boat to the dive point. It takes 10-15 minutes. Dive point in the area of coral reef ,where is living many coral fish and where located our pontoon. Pontoon is a special water platform with sunroof cover, relax zone with table, seat places and toilet and with special lift for immersion bikes in to the water. On the pontoon you will get final instructions from our divers and will go on an unforgettable trip under the water of Indian Ocean and will make a fascinating 25 minutes underwater traveling. 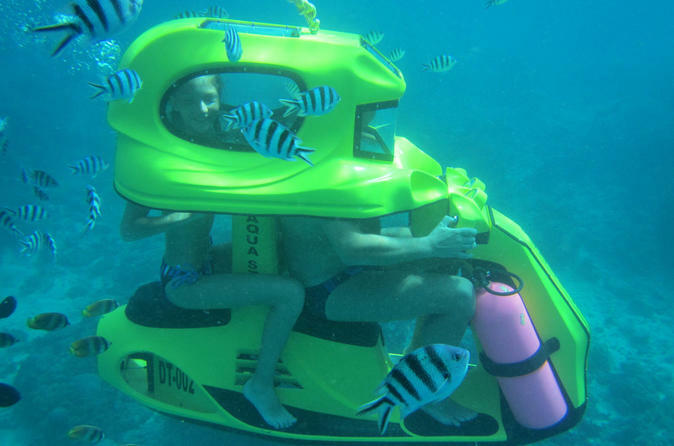 Unique underwater bike will take you to this journey where you will be captained. If you dreamed all life explore undersea world, but for some reasons could not. This trip for you. With the easiest control and with the feeling of total comfort under water nothing will distract you from getting to know the world of underwater depths. Underwater scooters very easy to use. Oxygen is injected straight into the helmet, so you can breath like on the surface without any equipment. If you can not swim, don’t worry, you only need to seat in bike ,feel relaxed and enjoy your trip.You can use glasses and makeup because the water level will be always by shoulders. You can talk with your friend because each scooter for 2 persons. Motorcycles moving under water in different directions with speed around 7 km at a depth of 2-4 meters. Depth of immersion depends on a season and water condition. For maximum safety of our guests we do dive only two bikes at the same time. Each bike is for 2 people. Additional safety will be provided by our experienced instructors who will follow your in the water. After underwater scooters riding you return by boat to our office where you will be able to take a shower, change clothes and our driver will drop you to your hotel.